Modularity is an interesting topic when it comes to electronics. In the desktop computing world, this is practically an assumed fact. Users can choose their parts, whether processors, memory, storage options, or video cards according to their application and budget. Enthusiasts can throw top of the line parts into their rigs, while those looking for the necessities can make a much more budget build. However, even better is the fact the cheaper machines can be improved with only a few part swaps, rather than starting from square one. Even laptops now allow for some upgrading. However, things are not as rosy when it comes to consumer electronics, particularly smartphones. This is not surprising, considering the perceived lifespan of a device like a phone is generally lower than computers. In addition, with how small phones are compared to a computer, it does not make upgrading an easy experience. However, people are still interested in this idea. Consumer modular phones are not new in concept, with projects like Phonebloks and, more notably, Project Ara from Google leading the charge. Steam was building for the beginning of 2016, and thus LG decided to out their own ideas of interchangeability. Today we have the LG G5, a phone built with customization as a major feature. How does this affect the daily use of a phone? Will it stand out from the other flagship phones? Read on to find out! 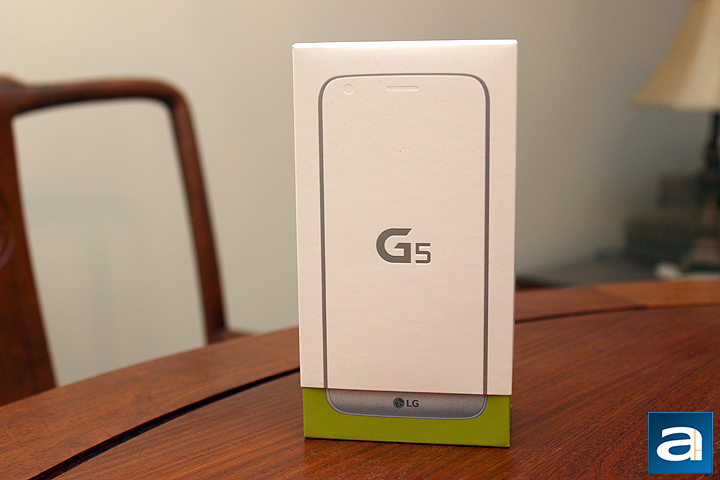 Today's review unit of the LG G5 arrived from our public relations contact in Toronto, Ontario. Traveling with the Canadian company, Purolator on their Express service, this parcel arrived to us in pretty good condition. The corrugated cardboard box had no dents or scratches to be concerned about. 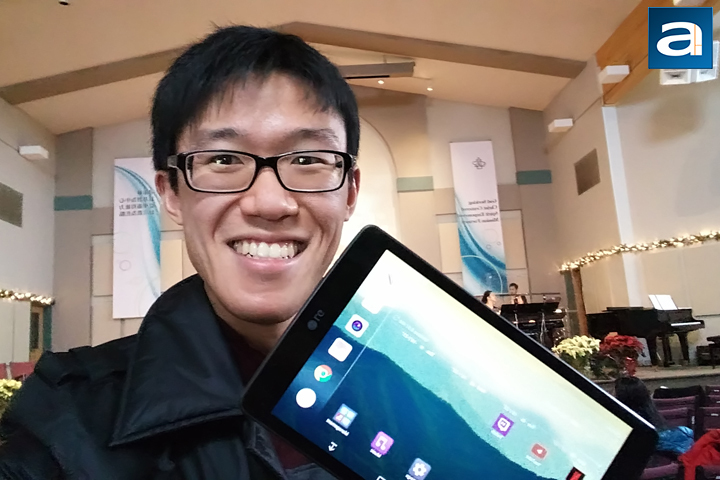 In addition to the phone, we also received LG's G Pad III 8.0 we looked at last week. 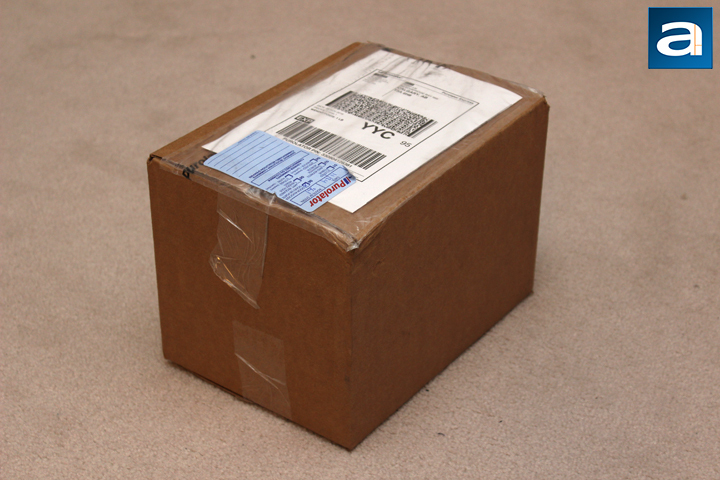 Oddly enough, there is no packing material inside to cushion the products from moving around. As there is quite a bit of empty space in the box, I would have liked to see a bit more padding, but thankfully, they arrived in good condition. Out of the shipping container, I grabbed the G5's retail box. This package has a pretty minimalistic look, even for smartphone boxes. A lot of the specifications are just a bunch of numbers, so it is not necessary for phone manufacturer's to display this on the outside. At the front, we have an outline of the LG G5 with an interesting box design. The top white cover slides off to reveal a green box. This sliding action is also a reference to how the modular design is implemented on the LG G5, as you will see later on. The product's name is printed right in the middle, with the manufacturer's name on the bottom side. The back of the box highlights the box contents, but otherwise the container is pretty uninformative. Out of the box, we have the LG G5 wrapped in a plastic sleeve to protect the phone from any scratches. On the phone is also a lot of seals everywhere to protect the glossy areas, including the screen and the sides of the G5. In addition to the phone, we have a white charger, with "Fast Charge" written on top. This charger conforms with Qualcomm's Quick Charge 2.0 technology, with the ability to deliver 9.0V at 1.8A, or the more standard 5.0V at 1.8A, depending if the device plugged in works with QC 2.0 or not. I will cover this more later on in the review. Finally, we have a 1.0m white USB-C to full-sized USB with USB 2.0 speeds. I do think the cable is a tad short, but I appreciate the fact this terminates with a full-sized USB on one end, rather than USB-C connectors on both ends. Unlike the other LG devices I have seen in the past, there is a higher sense of quality when it comes to the G5. Gone are the plastic build and construction, and replacing it is glass and metal. Compared to the LG G4, which had at most a leather backing, this is a huge step up, matching the top competition from Samsung and Apple. The entire body of the phone is metal, with Corning's Gorilla Glass 4 found on the front. In addition, there are a few curves found here and there. The corners themselves are more curved, resulting in a design that does not dig into your palms. In addition, the front panel is what some call a 2.5D glass, as it features a curved top edge and bottom edge. You might not see it much in the photo above, but the top part curves ever so slightly, making for a really subtle but nice look. The bottom edge also feels similar in this regard. This curve is not as drastic as some found on Samsung devices, but it still is noticeable. Overall build quality is great with these premium materials, and there is no flimsy or cheap feeling here. It feels weighty enough and compared to other phones like the Samsung Galaxy S7 or the iPhone 7, I would say the LG G5 feels similar. However, there are a few things about the G5 design I do not like, but I will get to these later. The first two set of buttons can be seen on the left edge of the phone. 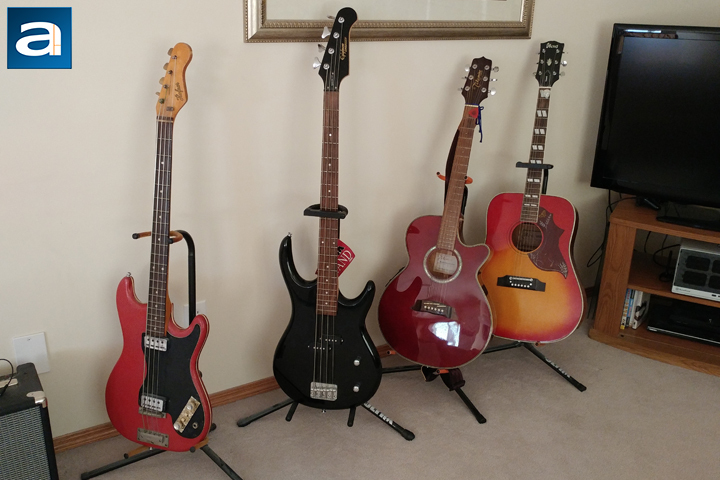 At the top is the volume rocker. It protrudes out enough to be easily identifiable without looking at the phone. There is another button near the bottom of the left edge, but I will talk about this in more detail later. The bottom edge houses three more things to note. On the most left side is a set of speaker grilles. The speaker gets quite loud, and while it may not be as impressive as front-facing speakers, it is relatively clear until pushed to the maximum volume limits. A quick comparison to my LG G3 reveals the bottom-firing speaker is clearer and miles ahead due to the better positioning. Housed in the middle of the bottom edge is the USB-C port. As one of the main advantages of USB-C is the reversible design, it is quite easy to plug in the G5. USB-C also has the potential for faster transfer speeds, but this is implemented over USB 2.0. Finally, to the right is a single microphone hole. One thing you probably cannot see in this photo is the front facing camera near the top curve. It takes photos at an 8MP resolution. The screen is a 5.3 inch IPS screen, with a resolution of 1440 x 2560. This translates into a pixel density of 554ppi, but I will comment on the screen brightness and quality later on in the review. From the back, you can see even more curves. The LG G5's back is rounded out from edge to edge, making it contour more to the hand. In combination with the metal design, this makes the phone a bit slippery to hold, though this is a common drawback to metal phones. This is partially countered by a shiny metallic rim that goes around the entire phone, but I still think the phone is slippery. At the top is a protruding camera hump holding the dual camera module, with dual LED flash and a laser auto-focus in between the two lenses. 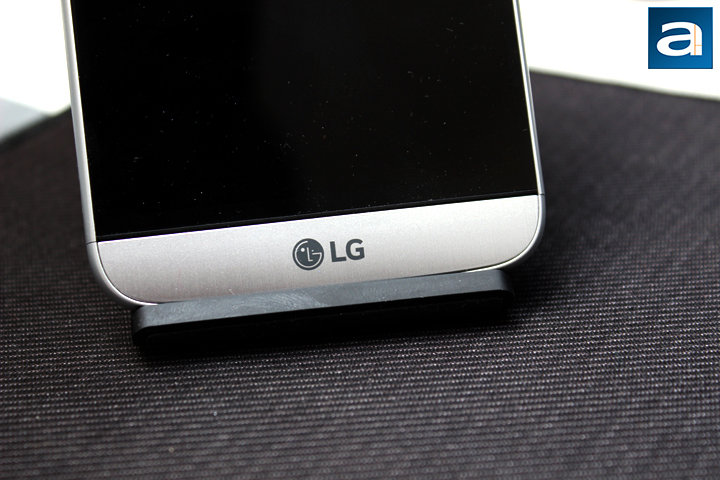 To be honest, when the LG G5 was first announced, I really disliked this camera hump. However, in person, the smooth protrusion actually looks okay, and it shows off a bit of character. The main camera is a 16MP camera, with a 29mm f/1.8 aperture lens. The other camera is a wide-angle, 12mm f/2.4, 8MP camera. Underneath the camera is a fingerprint sensor, which not only makes unlocking the phone faster, but allows the LG G5 to be used for mobile payments. While Android Pay is a developing ecosystem, it is nice to see this feature. Initially, when I used the fingerprint sensor, there were a few times where it would not register my fingers right away, but after getting used to it, it became more responsive. One thing that bothered me is the fact the fingerprint sensor also doubles as the power button. As other fingerprint sensors generally do not push inward, the button wobbles slightly when just pressing it. This can sometimes lead to inaccurate fingerprint reading, and I would have preferred to see the power button separate and on the side of the phone. At the top of the LG G5, we have another microphone hole to help with noise cancellation, an IR blaster, and a 3.5mm headphone jack. Down the right edge of the phone is the SIM tray. Popping out this small tray reveals a slot for a Nano SIM and a micro SD slot, expanding the internal memory to a theoretical 2TB. Powering everything is a quad-core Qualcomm Snapdragon 820, paired with 4GB of memory. This high-end processor was the top Qualcomm Snapdragon in 2016 until the 821 was launched. Even so, this phone should still run like a beast. Inside, we have 32GB of storage, though it translates into around 20GB of actual usable space. If you do not find this to be enough, you can still expand the storage with micro SD cards. Internally, this LG G5 connects on majority of LTE bands, depending on the version you get. This one in particular is locked to the Bell network in Canada. Other connectivity includes Wi-Fi 802.11ac, Bluetooth 4.2, A-GPS, and even FM radio. As I have mentioned in the introduction, the LG G5 was made with modularity in mind, and this is how they approached it. Now, it obviously is not actually fully modular, in the fact most of the internal components are not swappable. 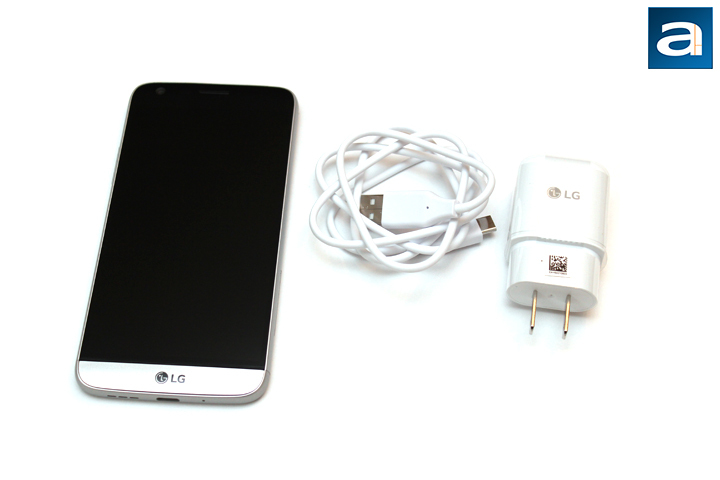 Rather, the base LG G5 comes with a removable battery and additional modules known as LG Friends. At launch, there were several accessories, but currently the only additional accessory is the LG Cam Plus. This adds a dedicated shutter button, zoom dial, and a larger hand grip in addition to an extra 1200mAh battery. Personally, I think this idea is a pretty neat one, but the real problem is the fact there are not a whole lot of accessories otherwise. As new phones come out every year, chances are LG will focus on their next phone and not continue to develop more accessories. In addition, because the bottom part is separate from the top, a noticeable gap is seen between the two metal parts, making it feel and look less than ideal. On the other hand, the fact there is a removable battery here is pretty nice to see, especially as many other phones are phasing this out. The standard battery is 2800mAh in capacity, which is slightly smaller than previous iterations of LG's phones. Even so, the LG has Qualcomm's Quick Charge 3.0 technology inside, making up for the smaller capacity, as it is able to charge the battery up in a shorter period of time. Powering on the LG G5, Android Marshmallow 6.0.1 can be found running on this device. From what LG has announced, Android Nougat 7.0 will be coming to the G5 soon too. After making a few changes, including running the latest updates and changing the home screen to a more usable one with an app drawer, this is the homepage I am now greeted with. As expected, LG has overlaid the standard Android interface with their own user interface. On the LG G5, we have a skin called LG UX 5.0, similar to what we saw with the LG G Pad III 8.0. It is relatively lightweight, as the biggest changes are seen in the Settings menu and the drop down menus. 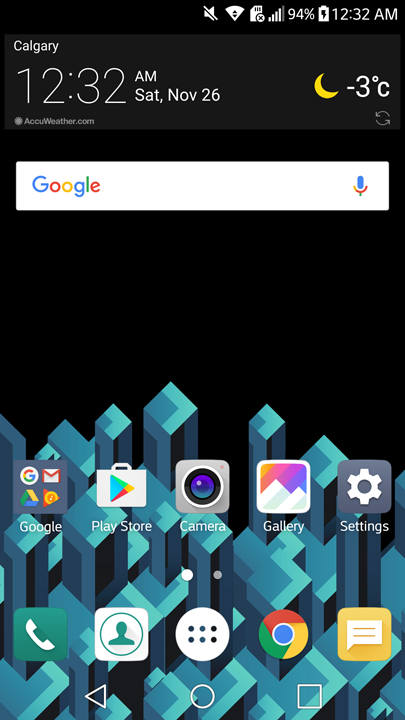 A more detailed look at the differences between LG's interface and the vanilla Android can be found elsewhere, but I will say after using several LG products, it has become less bloated in feel. 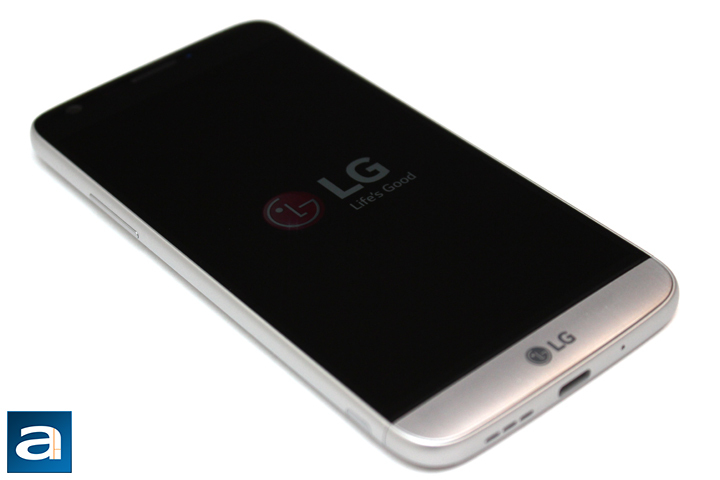 I used to only swear by stock Android, but I quite like the several enhancements LG has placed in. As this phone is from Bell, there are some Bell specific apps pre-installed on the phone, but otherwise, the amount of bloatware is not too high. I would still like to see less duplication of apps between LG and Google. It is a bit biased to say as I have used quite a few LG products now, but they are generally quite easy to pick up and use. Gone are the days where Android has a steep learning curve, and a lot of the enhancements made by LG has made navigating Android easier. As for the screen quality, I found it was quite good. The screen gets quite bright on automatic, and the colors look vibrant. The IPS panel also makes for better viewing angles. The blacks may not be as deep as some AMOLED displays, but I quite like the screen color reproduction. Another feature LG has implemented is an Always On display, which always shows the time and date on the screen. It also shows icons when new notifications come up, but it does not reveal any more information than the app triggering the notification. Some might worry about battery implications since the screen is on all the time, but to be honest I did not see a huge dip in battery life. I cannot fully comment on how the battery is overall, since I was not able to use this phone on a day-to-day basis, but I will say it seems quite good, and comparable to other flagship phones. I also quite like the fast charging, which topped up the LG G5 quickly. Unlike tablets, one big part of smartphones nowadays is the camera quality. As the old saying goes, the best camera is the one you have ready, and since most people have their smartphone with them all the time, this becomes your most used camera. As such, I tested the LG G5 in various conditions, looking at different features and things. Majority of the shots were taken in automatic mode, though the phone has a pretty extensive mode for manual adjustments, including changing aperture, shutter speed, ISO, exposure, and white balance. I left HDR in automatic, but I will point out when the photos have HDR active. All of the photos have been resized and cropped, but otherwise I did not perform any other edits. As for the first photo above, this is a standard shot taken indoors with ample natural lighting. As you can see, the color reproduction is quite true to life. In good lighting conditions like this, you can also see the camera has no issues with different areas like shadows. For a flagship camera, this is actually quite impressive. The subject of the shot is in focus, and this is aided by the laser auto focus on the LG G5. Of course like all smartphone cameras, when you zoom into these photos on a pixel by pixel basis, you will start seeing the imperfections, but I think it is quite good. 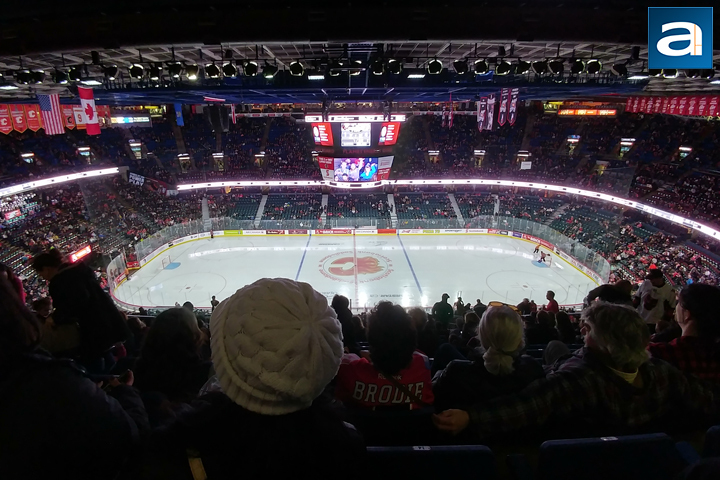 This shot was taken during the Calgary Hitmen's Teddy Toss game. 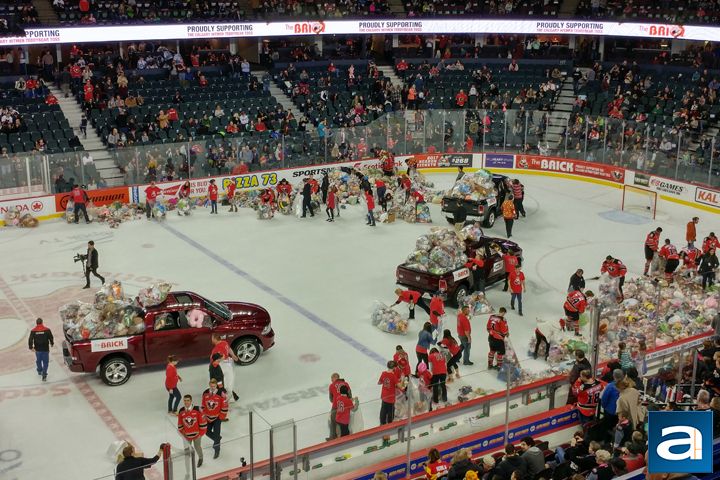 To give some context, fans are encouraged to bring stuffed animals wrapped in bags, and when the Hitmen score their first goal, fans are to throw the stuffed animals down onto the ice, creating a shower of lions, tigers, and bears! Oh my! This shot was taken with HDR mode on, and you can see as everything is quite clearly defined. The reds on the volunteers and hockey players' shirts pop out quite distinctly, as do the many other colors around the ice. The ice does look slightly green, though I think this is partially due to the lighting in the Saddledome. Otherwise, the photo captures a lot of detail, which is pretty much as expected since lighting was quite good here. This shot was taken after the toss happened and the ice was cleaned off. Rather than the standard lens, I swapped to the wide angle one to capture a shot of the entire rink. As expected from a wide lens like this, straight lines start bending out slightly, almost creating a fish-eye effect. Due to the high contrast in lighting between the foreground and the background, you can see the camera struggled with the lighting, especially on the Jumbotron. Even so, I think it has done a nice job, and I quite like the wide-angle point of view we see here. This point of view may not necessarily be used all the time, but it captures more of the shot without too much distortion, and is a pretty neat effect. Color reproduction again is pretty good, as is the relatively low amount of noise. For your reference, this shot had HDR mode active. This next shot is from my friend's place in a less than ideal lighting condition. As you can see here, there is a bit more noise overall, but I think the LG G5 has done a fine job. 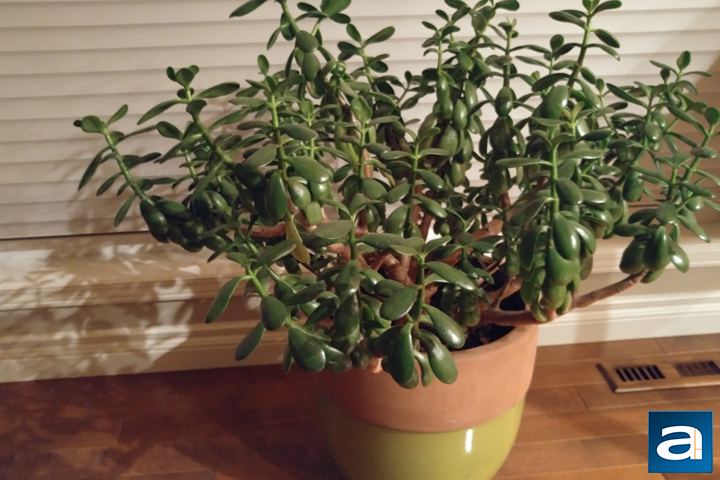 The leaves on the plant are in focus and the colors of the leaves, branches, vase, and floor is true to reality. The shadows show the phone automatically bumping up the ISO to capture the image, leaving a noticeable amount of noise, it is still very acceptable. At this point, I really am nitpicking, because the G5 is leaps and bounds a better camera than my personal LG G3. 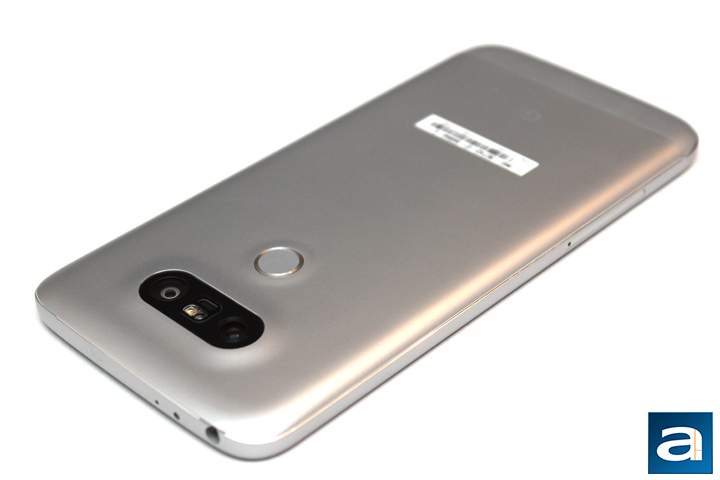 From the faster laser auto-focus to the overall more responsive camera, the G5 runs circles around the G3. Flipping the camera around, I handed my phone off to the APH Networks' expert of selfies, Editor-in-Chief Jonathan Kwan to try it out. Once again, this shot was taken indoors, with not a whole lot of lighting to be honest. Even though the photo looks pretty lit, this is actually due to the camera making compensations. In his hand is the G Pad III 8.0 because Jonathan wanted a picture with an LG, haha. Joking aside, the front-facing camera is actually pretty good in terms of color reproduction. A bit of noise creeps in, and some softness is seen in the picture, but even so it handles the contrast between the tablet's backlight and the overall room quite well. Colors on the face and in the background are on point, and the camera also easily focuses on the face. Speaking of which, the front facing camera does have facial detection, which helps in auto focusing. Since the launch of the phone, the modularity craze in phones has quieted down a bit, especially with the cancellation of Project Ara earlier this year. When I look at the LG G5, a phone with a major feature of swapping accessories, I have to say I am a bit mixed. The engineer in me wants to praise the innovation seen here. It is a pretty big leap going to something not ever seen prior. Even though you might just call it a removable battery, I see it as a gateway to more possibilities. As a high-end phone, it also does a superb job. Performance, looks, and build material choices are excellent all around. The screen is vibrant with good viewing angles and the Always On display is quite useful. The fingerprint sensor is fast and overall the LG G5 felt responsive. Of course, I would not expect anything less from a phone of this caliber, but it is great to see. The camera quality is also top notch in varying situations, with it staying up to task and maintaining detail and accurate color reproduction throughout. On the other hand, the modularity also detracts from the phone in a few ways. For one, while the technology and potential is cool to see, the lacking accessories on its own is a bit unsatisfactory. In addition, this creates a minor gap near the removable chin, leaving the LG G5 feel less than refined. Other things like the wobbly power button bothers me enough to wish LG separated the fingerprint sensor from the power button altogether. However, these are the finer details and I still think the LG G5 is a very good phone. Its main selling feature of modularity does require a bit more work, but it also shows LG is willing to think outside the box, and as a flagship phone, it is a worthy choice. 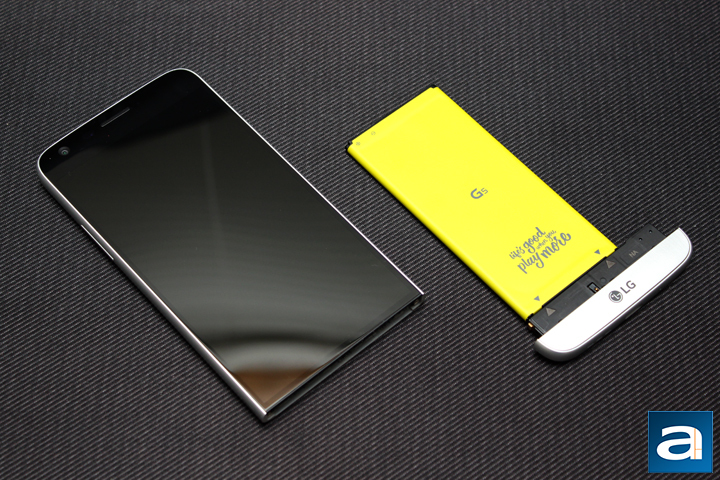 Do you have any comments or questions about the LG G5? Drop by our Forums. Registration is free, and it only takes a minute!